The Persimmon is a edible fruit which is yellow-orange color when ripe or dark red- orange depending on the species and variety. The ripe fruit has a high glucose content and has balanced protein profile. Like tomatoes, persimmons are not popularly considered as berries, but in terms of botanical morphology the fruit is in fact a berry. Peel the skin of Persimmons and cut into chunks. Add these chunks, honey, milk, shredded coconut ground nutmeg and cinnamon and ice into blender. Check to see what my fellow bloggers are cooking for BM 69. We have been to Strawberry pick last summer where we got lots of fresh strawberries. I have freezed a bag full of them as I was leaving to India the very next week and couldn't finish them before we leave.Though the chilled weather started here in New Jersey, I don't mind preparing this delicious frozen yogurt for my family. It is a healthy dessert as we are adding honey here instead of sugar. Can be served after dinner or as a mid day snack for your kids and grownups. This recipe goes to 4th week and 2nd day of Blogging Marathon under the theme Kids Delight- Fruit based recipes. Banana and chocolate together is a great combination to create many flavorful shakes and desserts. Adding banana to a regular chocolate milkshake gives it a very rich, creamy and fruitier flavor drink. This has become my son's favorite drink recently. K, my son who did not like ripe banana's at all, suddenly started liking them in a form of milkshake. Today we are starting with final week of BM 69. My theme for this week is "Kids Delight- Fruit Based Recipes". This is a great drink for breakfast, mid day or after school snack. Here goes the recipe..
Also add chocolate spread and chilled milk. Blend everything till its nice and creamy. Transfer in serving glass and sprinkle some borunvita powder on top. Bought these colorful sweet chilies from a store and didn't know how to use them. Used half of the chilies in Hyderabad Special dish Mirchi Ka Salan and it tasted delicious. As the gravy was spicy didn't feel like the chilies were sweeter. I had guests in the weekend and wanted to make some simple appetizer which doesn't take much time. Also didn't want something which is deep fried. So made a simple mashed potato curry which we usually make for masala dosa. And stuffed this curry in the chilies and baked them. They turned out super tasty and my guests loved them. 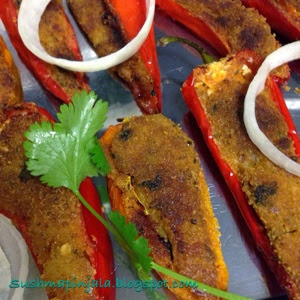 If you want to serve to kids you can add some grated cheese in the curry before stuffing or you can even dip these stuffed chilies in cheese instead of bread crumbs. But remember to serve these stuffed chilies hot as they taste best when they are hot. This recipe goes to Week 1, Day 3 of BM 69 under the theme " Small Bites".